Robert has a long history of anti-racial struggles that began against his parents whom he first challenged at a family dinner when he was 12. He was told to leave the table once he asked his father why was it that the black woman that had worked for the family was accepted when he, his uncles and his brother had hostile attitudes towards black people in general. In high school he became aware of the separation of the black from the white kids and questioned why it was that in the advanced study stream he was in, there was only one black person. He was sent to see his councillor for causing a disturbance in the classroom. In his last year in high school he committed himself for a final Civics Course project to document the American Nazi Party, whose home base was Detroit, where Robert was born and brought up. Whilst working on the project, he decided to photograph a Nazi rally in anti-black, anti-Semitic Dearborn, Michigan – the home of Ford Motor Company and its rabid anti-black and anti-Semitic owner, Henry Ford. There he encountered a group of tough looking men waiting for George Lincoln Rockwell, the Fuhrer of the Nazi party, to appear. He noticed all the men had blue numbers tattooed on their wrists. When Rockwell appeared, Robert was standing in no-mans-land between the Nazi guards and the tattooed men. All hell broke loose; stones were produced from their pockets; the Nazis were hit and began to retreat, the men climbed the fence and one tackled Robert and dragged him to safety. That was his first experience of civil violence. After that he joined a group of young people and an English teacher to attend the March On Washington, in August 1963 where he found himself roughed up by a gang of sailors, but he heard Martin Luther King speak. In university he became active in politics on the campus where the Students for a Democratic Society had been formed. He ran a political campaign demanding equal rights for all and then joined a small group of University of Michigan students to go to Montgomery Alabama. MLK had asked for white students to help present a demand to the racist governor George Wallace to allow the second Selma march to be allowed to proceed in peace. Robert’s groups were savagely attacked by mounted KKK, supported by state troopers on motorbikes. One of the students suffered permanent brain damage, others had broken bones, and Robert, when hit by a bucking horse, was saved from serious injury by the intersession, but permanent damage to his camera. Later that day, a CORE representative asked the remnants of the students to attend a meeting in a small wooden church in the centre of the black neighbourhood. About 60 people were there and to their surprise MLK showed up to thank and to talk with them. Soon they realised that they were surrounded by a posse of KKK on horseback all carrying lit torches, and again backed by armed state troopers. After being trapped until about 2 or 3 in the morning, somehow the black community realised what was going on and came out in their thousands to surround the KKK and the police who suddenly drained away. Throughout university and into his earliest days in the UK, he spent arguing for equality and fighting against Nazis in the National Front. This has continued throughout his career, not only in the stories he has told and in his exhibitions, but through employment practices for women and for minorities and as well in his choices, as for instance, to follow the ANC’s wish for film companies to not film in South Africa during a certain period. He lost one of his biggest clients over this issue. 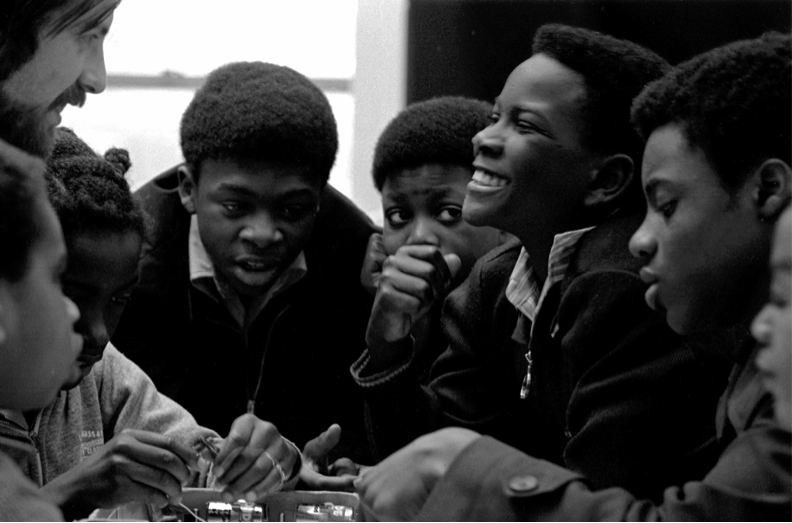 In the early 1970’s he worked for several months on an extended photoessay about Brixton (and for 2 days with James Baldwin) that was published in Nova Magazines pre Christmas issue as the largest photo-essay ever released in the UK. At first Nova rejected his pictures, accusing him of trying to pass off pictures from Harlem as pictures of Brixton. (He told them to look closely at the architecture, the street names and the cars). Later he created a lightweight easy to hang exhibition about black people’s lives in London called WATER CAME OUT OF MY EYES, which, on each page compared past history with the then present day. This picture of an unemployed building worker was key to it. Remnants of that exhibition are still in his possession. This was widely shown and caused an agitated demonstration by young black people in both Battersea and in Bristol when the exhibition was shown. These young people became more aware, through the documentation, how their lives were being circumscribed by the same racist forces, laws, statutes and attitudes that had so injured their pre-generators. In his recent exhibition and book called HOME, there are sections and passages dedicated to how racism has been used as a tool to divide the working class. You can see a reference to this here. At present Robert is working on a project called EXILE, with two artists, one of whom is a young asylum seeking refugee painter from the Democratic Republic of Congo. For whatever reasons, a desire to live in a society of justice and equality is central to Robert’s identity and has been at the core of much of his life’s experiences. He has just finished writing and illustrating a visual autobiography which in part describes how, thorough his own visual education, he learned about the bigger world.